It's hard to imagine Antarctica as anything but a frozen wasteland. Bitterly cold even in summer, barely any precipitation (if it were warmer, Antarctica would be classified as a desert), much of the continent buried under a sheet of ice hundreds of feet thick. The central "dry valleys" of Antarctica were used as a proving ground for the Mars rovers -- because it was the place on Earth that's the most like Mars. It's kind of cool that H. P. Lovecraft, writing early in the twentieth century, recognized that this icy and inhospitable land might not always have been that way. In one of his best short stories, "At the Mountains of Madness," we find out that the continent was once inhabited. And by "once," I mean tens of millions of years ago, long before Homo sapiens appeared on the African savanna. The denizens of the place -- the "Elder Things" -- were bizarre beasts with five-way symmetry and brains far more advanced than ours, and they built colossal edifices (invariably described as "eldritch") which, in the context of the story, are the subject of a scientific investigation. And being that this is Lovecraft we're talking about, it did not end well. Even more interesting is his story "The Shadow Out of Time," wherein we find out that the Elder Things amassed the information they have by using their eldritch (of course) technology to switch bodies -- they can flip their consciousness with a member of another sentient species anywhere in time and space, spend a year or two learning about the species and its culture, then flip back and write down what they found out. And pertinent to the current topic, Lovecraft describes the Elder Things as living in Antarctica a hundred million years ago, at which time the frozen continent was a warm, lush, humid jungle. Lovecraft's prescience was shown when plate tectonics was discovered, twenty years after the author's death. Antarctica wasn't always centered at the South Pole, and in fact had drifted in that direction from somewhere far nearer to the equator. Fossils of temperate-climate organisms were found in abundance, indicating that the climate had shifted dramatically. 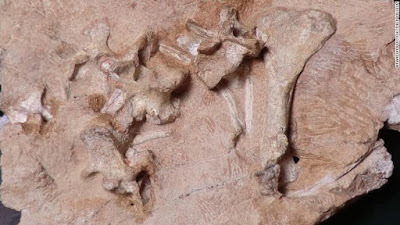 And just last week, paleontologists working collaboratively between the University of Washington and the University of Witswatersrand (Johannesburg, South Africa) published a paper about an Antarctic fossil archosaur -- a group related to the earliest dinosaurs -- from 250 million years ago. "A Novel Archosauromorph From Antarctica and an Updated Review of a High-Latitude Vertebrate Assemblage in the Wake of the End-Permian Mass Extinction," by Brandon Peecook and Christian Sidor of the University of Washington and Roger Smith of the University of Witwatersrand, describes a new species and genus of dinosaurs -- Antarctanax shackletoni, touchingly named after Antarctic explorer Ernest Shackleton, which was around in the very early Triassic. This puts it at the point where dinosaurs were just beginning to diversify following the largest mass extinction in Earth's history, wherein an estimated 95% of species died. "This new animal was... an early relative of crocodiles and dinosaurs," said Brandon Peecook, lead study author and Field Museum of Natural History (Chicago) researcher. "On its own, it just looks a little like a lizard, but evolutionarily, it's one of the first members of that big group. It tells us how dinosaurs and their closest relatives evolved and spread." What's most interesting about it is how different it is from other archosaurs of the time. "The more we find out about prehistoric Antarctica, the weirder it is," Peecook said. "We thought that Antarctic animals would be similar to the ones that were living in southern Africa, since those landmasses were joined back then. But we're finding that Antarctica's wildlife is surprisingly unique." As befits the strangeness of the continent itself. But it's a cool discovery nonetheless. I find it intriguing to picture what it was like in the distant past -- and the more we find out about it, the more we show the truth of the old adage that "there is nothing as constant as change." My imagination balks at thinking of Antarctica as a jungle, but we're finding that Lovecraft's imagined picture of the paleoclimate of the frozen continent was spot-on. I just hope he was wrong about the Elder Things and their pet Shoggoths. Because those things are freakin' creepy.